All fish enthusiasts and all those who keep an aquarium at home need to have a good knowledge on cleaning a glass fish tank. Keeping a glass aquarium at home or work place is great joy. It is said that the aquarium attracts a lot of positive energy. However, great responsibilities come along with the aquarium. Maintenance of the glass is not a difficult task. With just a few ingredients, correct procedure and your interest, tank glass can look clean and new. Cleaning of the glass of the fish tank is the most important aspect of fish tank cleaning and is the key to the health of your fishes and their long life. Glass aquariums get a clouded and a frosty look due to the hard mineral build-up. Make sure you set aside some time to tend to your glass fish tank every two to three weeks. Remember, the environment in the fish tank is not self sustaining. At the first instance, place your glass fish tank away from the direct sunlight as it will help in controlling the growth of algae. This would facilitate minimizing the scrubbing that would be required for keeping the tank clean. The presence of an algae eating fish in the tank does not relieve you of your responsibility of cleaning. Always keep an algae scrapper at hand. As a golden rule, always remember that you should not clean the glass fish tank with dish soap and water. The residue of the soap is extremely difficult to rinse off completely, and this can be harmful to the fishes. Always remember to address the individual components of your tank. The most typical problem of an aquarium is dirty water, which can be solved by using a power filter. Your tank could be almost self cleaning if you take care and maintain the power filter on a regular basis. In case of power filters not being maintained, the water in the tank would get dirty and you need to siphon and replace the water. However, never change the complete water at one go as would kill all the useful bacteria colonies in your aquariums eco system. 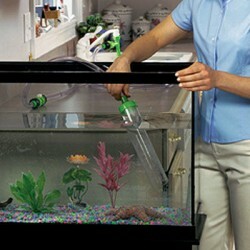 Always control the feeding of your fishes as overfeeding would leave the water cloudy as they produce a lot of waste. As a thumb rule, feed the fishes only the amount of food that they can consume within a 3 to 5 minute period. Change of water is probably the only way to fix the problem of cloudy water. Do not use any cleaners. Use salt solution and hot water for best results. You can also use vinegar. Take care of the power filter. Change cartridges on a regular basis. Change about 20% of water every month.